At the The Scholar Starters, teachers will seek to maximize the academic potential of each child and develop both a positive self-image and the child's full range of motor skills. In an environment rich in sensory experiences, the child will learn must in the areas of language arts, mathematics, social studies and science through thematic units of study, hands-on activities and expert instruction. Free play, music, art and drama activities will stimulate creativity and self-expression. A small pupil to teacher ratio ensures that each child's individual needs are met. Each class has a full time assistant in addition to the classroom teacher. Every classroom provides an environment rich in sensory experiences. Pre-primary students take special classes in art, music, science lab, computers, library/media and physical education, once a week. Learning would be fun for preschoolers at the delightful toy room, informal junior's library, storytelling room, dance and music rooms, splash pool, sandpit and outdoor play area. 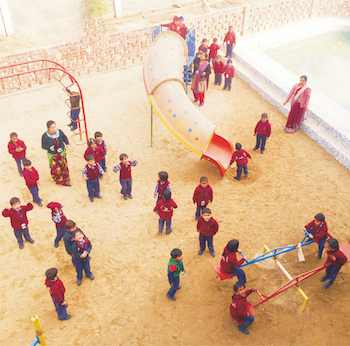 Children have access to various activities throughout the day. The seating arrangement is paired, grouped or informal allowing buzz sessions & easy sharing of ideas, to follow the principle of collaborative learning.